The rising star that’s still affordable. 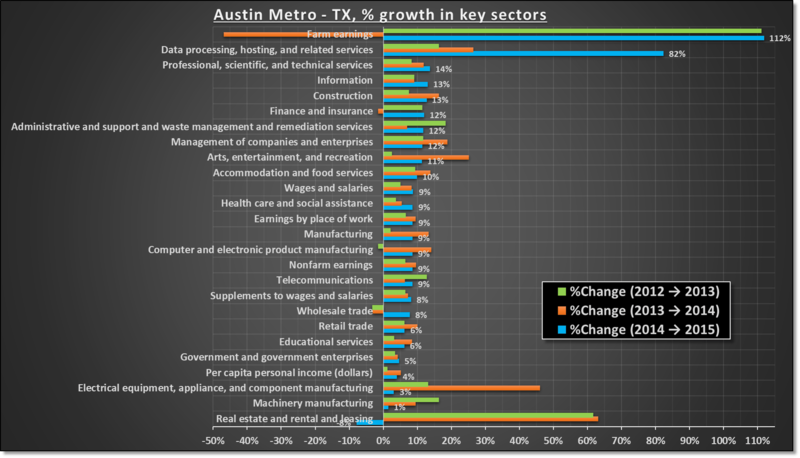 Austin metro growth rates by select industries, 2012-2015. This data for select industries in Austin metro region–spanning Bastrop, Caldwell, Hays, Travis, and Williamson Counties–shows impressive growth in some of the high paying industries. With houses still much more affordable compared to other fast growing metros (of Seattle, Denver & Portland as well as California), Austin is expected to be next top destination for the young and qualified. Eight out of top ten industries are in technology & management, which is very different from what we see in Seattle & Portland. In these regions, Tech and management sectors are competing with hospitality and housing for top spots. The housing market in Austin lagged behind other fast growing regions & was one of the slowest growing sector in 2015. Therefore, even today, one should expect more affordable housing in Austin than any other west coast big city. With wage growths higher than Portland and Seattle, Austin should expect more employees from across the country. Despite ten years of solid economic growth in US, wage growth has barely nudged above 3%; a three fold rate of increase is expected to draw attention across the nation. The farming industry is relatively small and therefore tends to have larger growth swings. Source: Bureau of Economic Analysis (table: CA5N: Personal Income by Major Component and Earnings by NAICS Industry under Local Area Personal Income accounts).